Vita Zaman met one of her favorite artists, Pierre Bismuth, at the Blaue bar of the Sacher Hotel to indulge in some of the most famous Viennese activities: talking, drinking coffee, eating cake, and disagreeing. Pierre Bismuth: What kind of cake is that? Vita Zaman: Sacher torte. Cakes make me happy, sugar is a potent drug. Pierre: I’m not so much into sugar. 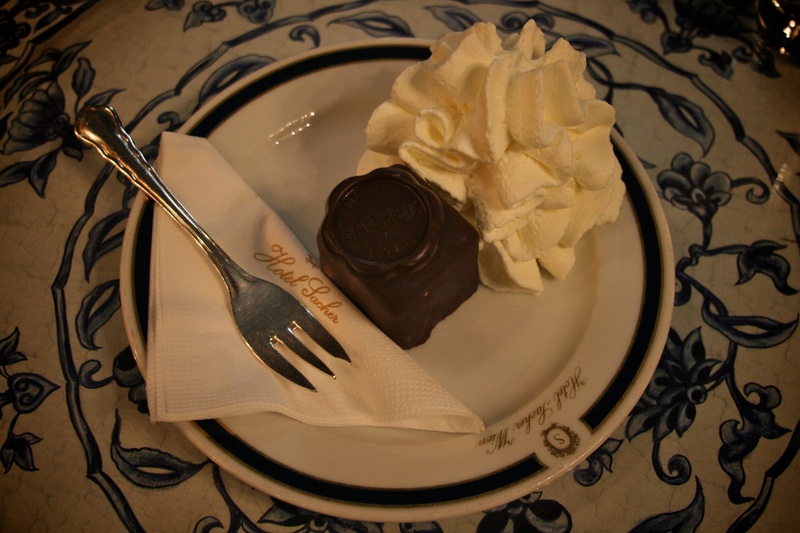 Vita: This chocolate cake is said to have been invented in Vienna by the chef Franz Sacher in 1832. Ingredients: plain chocolate, butter, softened, caster sugar, vanilla extract, eggs, ground almonds, plain flour. For the topping and the icing: apricot jam, plain chocolate, double cream, milk chocolate! 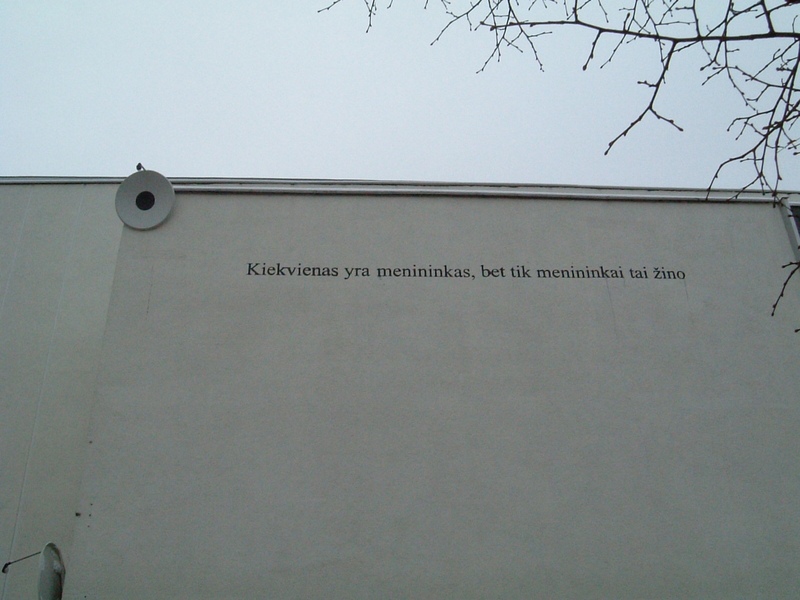 Do you remember your work on the wall of the Contemporary art Center Vilnius, which stated: “Everybody is an artist, but only the artist knows it”? I grew up with this intervention and I think it has affected my views on life and art in more ways than I can count. Pierre: You are not an artist before you’re conscious of it, and you are not conscious of it before you start to know about art. Being creative and being an artist can be two different things. Vita: What about Joseph Beuys’ “everyone is an artist” proposal? Pierre: Yes, but this is why I wrote this sentence, everybody is an artist but only the artist knows it, because, it’s probably true in theory but only artists are aware of that fact. Vita: Okay, so, when did you become aware of the fact that you are an artist? Pierre: God, that’s difficult to say! When, probably, I decided to become an artist. I would say, in the 80s… I was late, actually, compared to my friends, because I didn’t study art. Vita: What did you study, philosophy? Pierre: No, I studied visual communication in Paris, at Les Arts Décoratifs de Paris. So when did I decide to become an artist? I think in the late 80s and then I really only started to study art. Pierre: Yeah. When I was in Berlin, I started to study art, and I was really into Beuys. 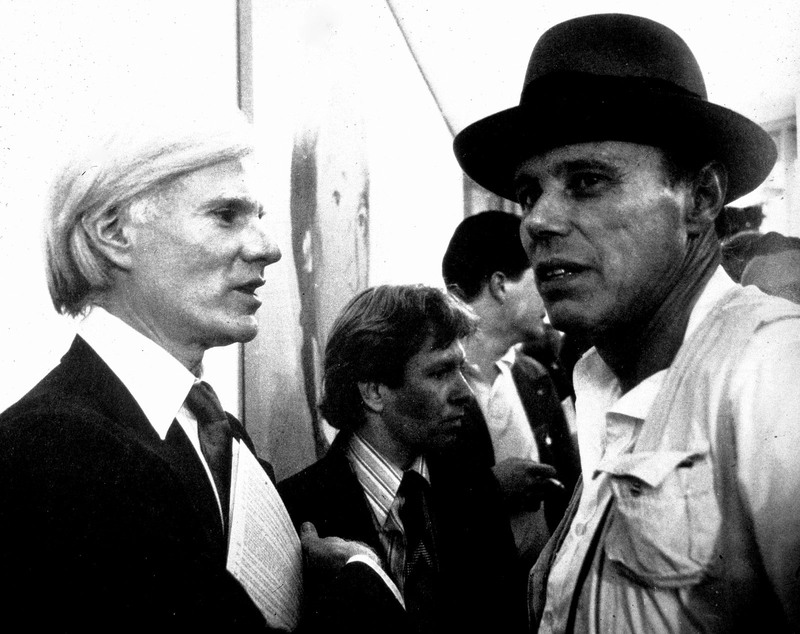 Vita: Why Beuys, why not something more elegant like Warhol? Pierre: I don’t think I was so much into pop. Do you prefer Warhol? Vita: Yes. Was Jeff Koons ever a big influence to you? Pierre: No, I don’t think so, I never really understood American pop art… It’s too far away from me, I think. I understand it much better now. Vita: It is very intelligent and subversive practice, naming our time and culture. Pierre: Yeah but still, it’s about consumerism. Vita: Everything is about consumerism. Vita: Life is about consumerism. We are consumed by time. Pierre: No, not in the sense of pop art. I mean pop is really about consuming goods. I was born in France, my family is from North Africa, my father was a doctor and a teacher at the university, and we were not brought up with this idea of consumption, goods, and money – so it’s not a part of my culture. You’re younger than me as well, so it’s different now. Maybe now consumerism has reached everyone. Anyway I was in Germany at that time and that’s also probably why I got into Beuys. Vita: So your statement is more a kind of art historical conversation rather than a daily revolution of visual culture from YouTube and Facebook anarchic creativity. Pierre: Art is not for everybody. It is only for everyone who thinks it is for them. I think anybody can actually access it, the problem is the common prejudice that if art is not understood by everybody then it is elitist. It’s just simply not possible to reach everyone because not everyone is into art. The same way not everybody is into street art, It doesn’t imply necessarily it is elitist. Vita: Should art change or die off – if it has lost its capacity to be relevant and touch people’s lives? Pierre: I’m not interested in mass audiences. I like the fact it’s reaching only a few people, a niche. But a niche is not necessarily an elite. It’s just a few people who are into that niche. Vita: I think museums will run into huge problems, as they are becoming like huge cemeteries or storage spaces, they will have to reinvent and rebrand themselves like Kunsthalle Wien is doing now. Museums will have to take on a festival mode, they will have to become social spaces, meeting spaces, otherwise they are redundant time capsules. Pierre: What you just said is very interesting. I do not believe that the art system really wants the mass audience to be into art, I think that’s not true. Pierre: Museums only need a large audience to raise money. The problem is actually that on the one hand the art system wants to have a large public to prove its social relevance but on the other hand seeks to be autonomous from the main stream and from the traditional economic system. In other words no one in the art system wants the mass audience to dictate what’s good and what’s bad as it happens in the film industry or the music industry. Pierre: I’m very happy. I’m not necessarily satisfied but I’m very happy. Vita: Is it possible to be happy as an artist? Vita: I always thought artists have a kind of mental inability to deal with reality, thus they are daydreaming, changing it to a new one, or being critical without any solutions. What’s the responsibility of an artist? Vita: And then I ask “What does it mean to be happy?” and then, of course, you go into xyz and then you realize there is no such thing as happiness. Pierre: This is something I never really understood, this is not part of my program. I’m never waking up in the morning thinking “Oh, I’m gonna be happy today”. Vita: Because you already are. Pierre: I don’t know, because I want to do interesting things, that’s what I’m into. I want to do things that are interesting and I just want to be busy with interesting stuff. Pierre: For me, interesting life, because then I don’t think about happiness anymore. But maybe I was never happy, or I just don’t even know what it is. It’s possible. I have to accept that possibility. Vita: How do you feel about psychoanalysis? Vita: Have you ever done it? Pierre: No…. Ah sorry yes, I did actually, for a performance. I did a lacanian analysis for,7 hours on stage in Paris in 2010. Vita: At some stage, do you think it’s important to stop making art because there’s too much of it? I spoke with Francesca Habsburg. She is a big collector and had very radical ideas about how to deal with the overproduction of art objects. Pierre: But she can do it easily, no? Vita: Well, there are such concepts as ethics and responsibility toward artists and artworks. Pierre: I do not understand that when you do an art fair, you cannot show old pieces. Galleries always want you to do new works because if it remains unsold it means it’s not good. Vita: It’s called burned art, burned artwork. Pierre: I think it’s easier to just put new dates to old works. Vita: That’s a great idea! Pierre: Recycling just by putting a new date. It would very much look like an old piece, but it would be a new one. And it is of course totally opposite to backdating works, which is what artists do usually. Vita: Okay, enough of this art stuff. Family. How important is family for your happiness? Pierre: Not for me. Sorry, but not for me. Do you want me to say something else? My wife and my kid are important to me but not my family.. They are important because they are human beings and because I love them but not because of the concept of family. This is not important to me. It’s not a driving force for me, sorry. Vita: Artistic community as a family? Pierre: Artistic community, yes. More, maybe. Vita: Are you on Facebook? Pierre: I’m not really into this kind of things but I ‘m in favour of free Internet access everywhere in the world, and free telephone as well. I don’t really understand, why do we have to pay all those things? Vita: But what would you communicate all the time, I already suffer from the information overload. Pierre: Phone and Internet access should be free because then it would become so uninteresting and just functional. Vita: So we say, Pierre says, happiness is free Internet and telephone. 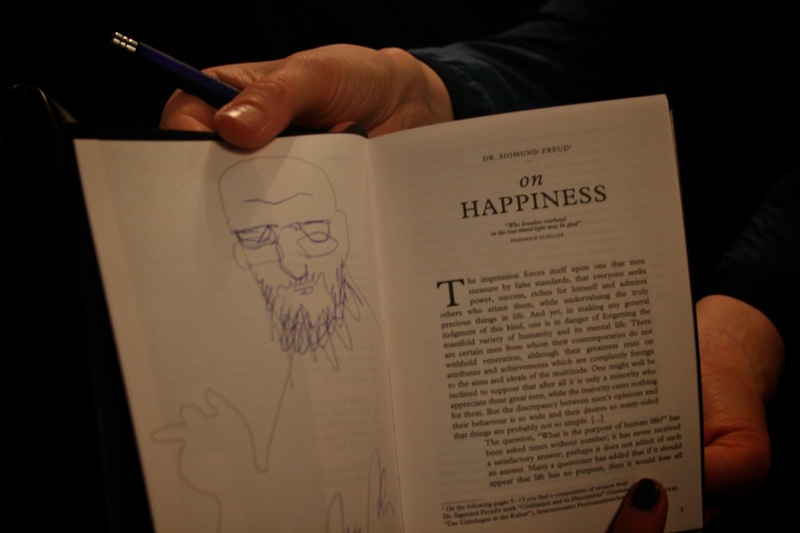 Pierre: No, not happiness. Pierre does not believe in happiness, neither family. Perfect. Vita: What do you think about Vienna? Pierre: I like Vienna, it’s a real city. It’s big, I like the dimensions of the streets and the buildings, you can feel the old empire, which I like. I live in Brussels, you have to understand, it’s kind of medieval place and I don’t like that period of history. I like the aesthetics of Vienna. Vita: Are you in love with Vienna? Pierre: I could live here for a while. Even though I realize I could fight with the Viennese easily, there’s a kind of tension immediately. They have this school teacher kind of tone, they have a dry school teacher tone that doesn’t work with me. They seem to be annoyed immediately about everything. Yesterday, I was the restaurant, starving, there were those Grissini on the table, I took it and saw the face of the waiter. He looked at me nearly like if I was a criminal. It feels like they have a problematic relationship with authority. I don’t know if it’s true, but I have the feeling my attitude might be a problem here. This is a really vague feeling. But anyway I would love to live here actually for a while. Pierre Bismuth (b. 1963 ) is a contemporary artist. After having studied visual communication in Paris with Pierre Miehe (with whom he collaborated on a few projects) in the seventies, he moved to Berlin in 83 to study painting in Georg Baselitz class of the hogeschule der kunst. He then began to work in Paris where he shared a studio with Pierre Huyghe and Xavier Veilhan. His work has been exhibited in famous institutions as the Witte de With in Rotterdam or the Lisson gallery (who made him move to London for a few years). He now lives and works in Brussels. Pierre Bismuth’s work tirelessly explores the multiple manifestations and products of knowledge and culture. It is engaged in a constant process of translation, of moving from one form to another, from one logic to another as if in search of a hidden meaning.But instead of revealing something concealed, Bismuth’s transformations aim at creating a new, parallel reality. Not an answer but a new question. The rules under which this new reality operates, sabotage the unique and fixed meaning of the cultural products from which it is initially derived. Bismuth’s work has been shown at Christine König Galerie (Vienna). Next exhibitions include a solo show at the Kunsthalle Vienna in 2015. Tags: American pop art, Andy Warhol, CAC, Christine König Galerie, conceptual art, creativity, Francesca von Habsburg, happiness, Jeff Koons, Joseph Beuys, Kunsthalle Wien, Pierre Bismuth, pop art, populism, Sacher Hotel, the Contemporary art Center Vilnius, the third man, Vilnius. Bookmark the permalink. 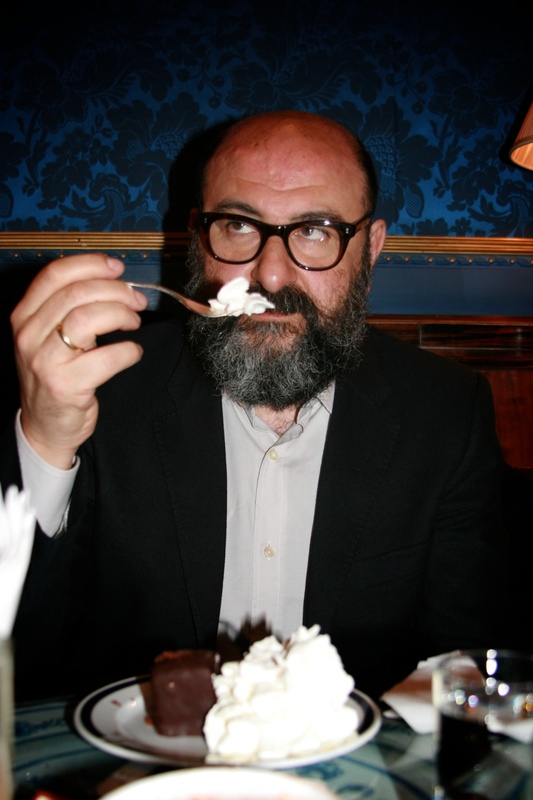 You and Pierre Bismuth are wearing the same dark sunglasses, unlikely fixtures at the plush Sacher Hotel, eating the most traditional of traditional cakes, the ‘sachertorte’ and discussing limits of art’s relevance as well as exclusivity vs. mass consumerism! I found this juxtaposition of place and subject matter, almost a performance piece (whether planned or not) when this cake only tastes good at the Sacher and not when it comes from the gift box which is mass produced in all sizes and shape as well as dried out by the time a bite hits your palate. As said by the artist, “only a few artists can be real artists otherwise it’s a mess, otherwise it destroys the whole market”. You might say the same is true of the ‘sachertorte’ except for those who do not know any better. Is that not a current universal issue? My credo that everyman is an artist (whether he knows it or not) stems from a moment when I also discovered Duchamp who embraced the destruction of his own ‘creative act’, The Large Glass’ introducing the conscious element of chance as part of the work itself. Amazing concept for this youthful art history student. And, with that privilege, Duchamp could then wag his finger at the art world for many years while choosing to play chess as he came to the “personal conclusion that while all artists are not chess players, all chess players are artists.” Thus the artist’s position of Beuys in relation to Duchamp found a soulmate as we are, in many respects, a century later in the arms of Duchamp. Pierre’s philosophy cannot be said often enough that the key role of the artist is about “reconsidering the way we perceive things” and discovering his person in the process. 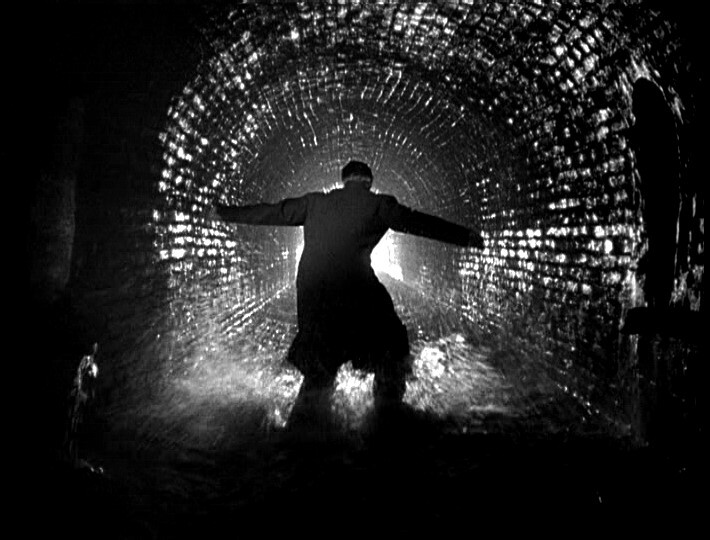 To conclude, perhaps the real irony of your dialogue was lurking between the folds of perfectly whipped cream beside chocolate decadence, a lot better than a chase through sewers of The Third Man.